This chair was a monumental find for me. It was my first roadside find. I found it even before I found my metal cabinet that I turned into craft storage. I was just, ummmm, slow, very slow about getting around to fixing it. I think the wait was worth it though – I love how this chair makeover turned out. Where I live, there just don’t seem to be many roadside finds. I’ve been on the lookout for the better part of ten years and have found two to date. I was so excited about this that I had my friend snap a picture when I was picking it up. As with all things that seem too good to be true, this chair did have a flaw. The back legs looked to be missing their feet. They were both angled off. To fix them, I chopped them off to make the back legs flat, then drilled a hole and put in feet from a table I had bought at a yard sale that I didn’t need. After I fixed the feet, I stripped all the fabric off the chair, then gave it a coat of primer, then a couple coats of Dragon Fruit by Behr in a gloss finish. I used my HomeRight Finish Max Pro to do all the painting. Next was the fun part, upholstering. 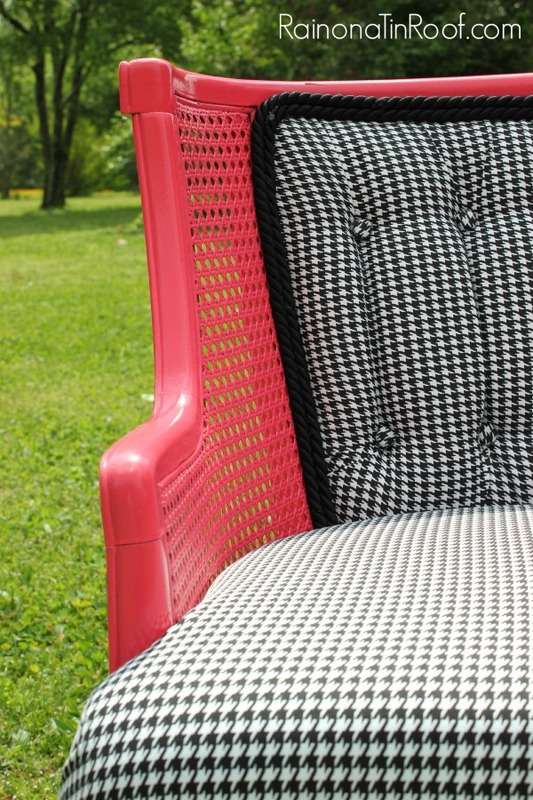 I was really excited about the fabric I chose – Houndstooth Black Fabric. However, I was worried about upholstering this chair – perhaps why I had put it off for so long? If you noticed the back of this chair was tufted. I was terrified of tufting. I had never once attempted it. Now, I am so mad at myself for not trying it before – it was so easy! 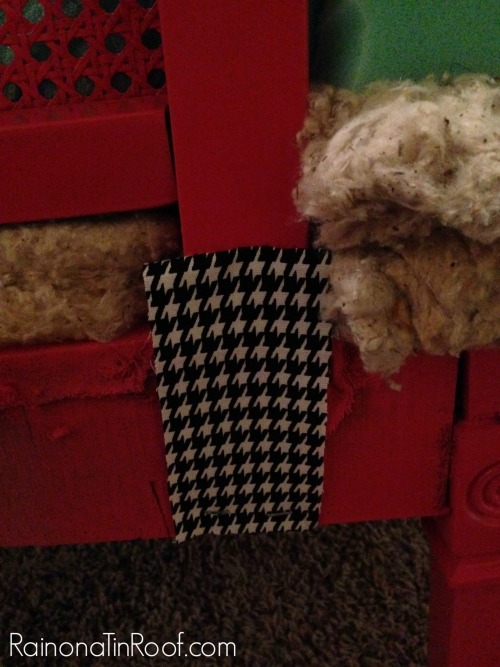 Before attempting the actual tufting, I took the old buttons and wrapped them in the houndstooth fabric with hot glue. ‘Cause I’m a professional like that. First, I cut a piece of fabric that was about double the size of the back. You don’t need that much – I was just worried about not having enough. Then, I poked my buttons through, starting in the middle and working my way out. You can see in #3 how it looks on the backside. You put a little disk through the metal prongs, then spread them out. After I had all the tufting done, I trimmed the fabric and stapled it around the edges, then trimmed it out, like I did on my Jonathan Adler inspired chair. 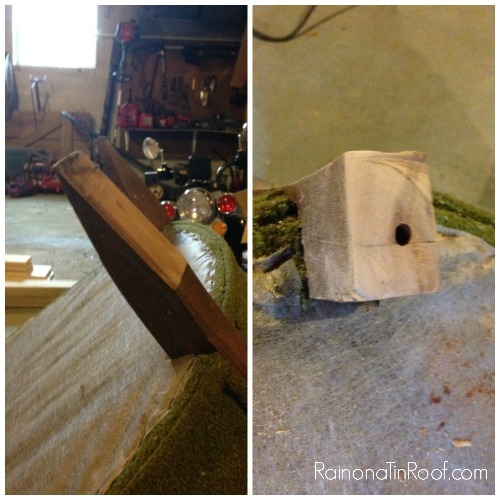 Next, I started on the seat. You can see the layers of everything below. Because I hate to sew anything that isn’t a straight line, I used the old seat cushion to trace out a new piece of foam and just made the whole seat one piece. Before doing any of the main seat upholstery, I did these little patches on the side. 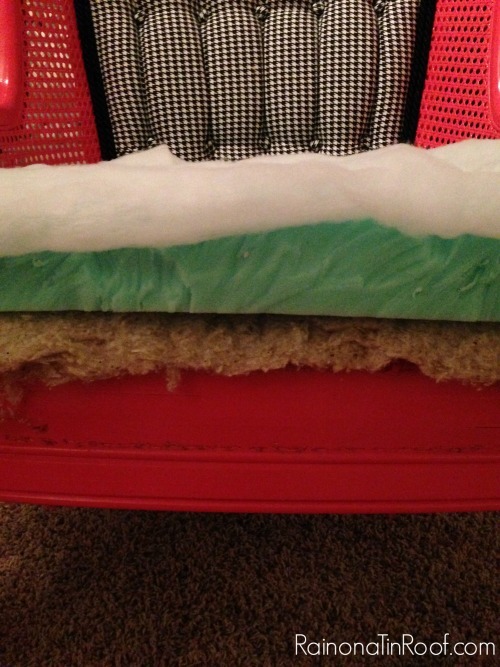 Then, I just cut a large piece of fabric, pulled, and stapled around the bottom of the chair as necessary. 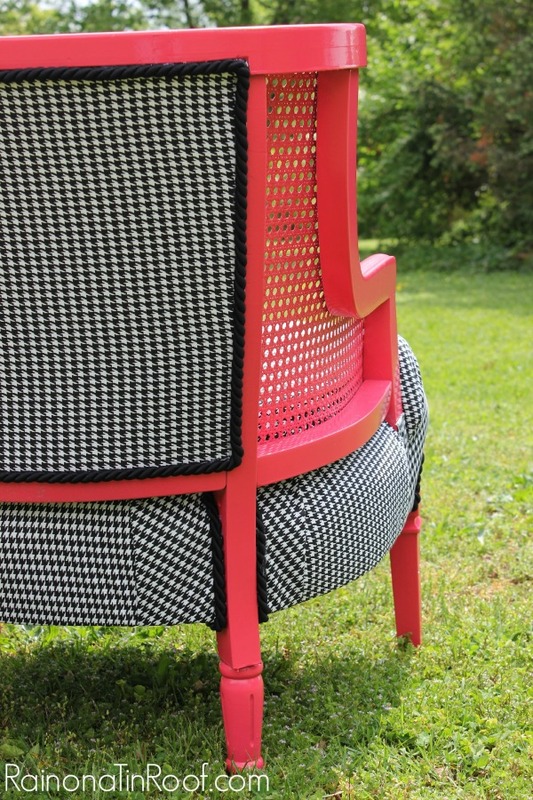 I love the combination of the pink paint with the houndstooth fabric. I think it would be perfect for a little girl’s room. I kept the trim a simple black just because there was so much color going on with the pink. 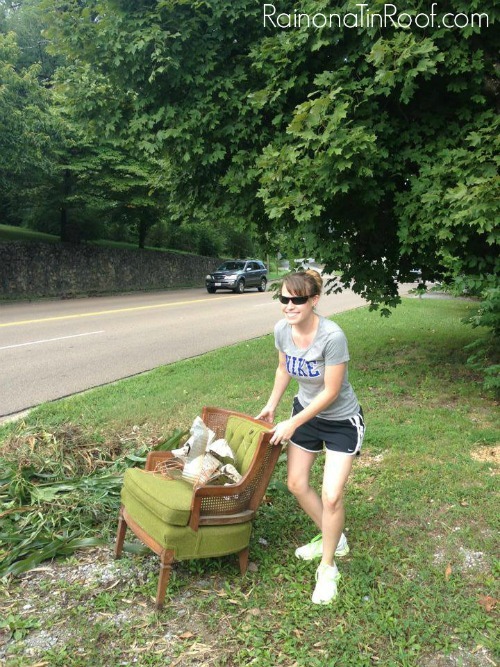 Have you ever done a chair makeover with a roadside find? A nice tiger stripe would have been pretty. Wow that looks awesome.. why can’t I be creative like that…!! Oh, Tammy, you can be! Just try something different! This turned out gorgeous! And yes it would be perfect for a little girls room!!! That is exactly what I was thinking when I read that line! I have a rescue chair ($5 from a thrift store) which I’ve had since last summer. It’s bright/burnt orange and in need of a desperate makeover, but I haven’t done that yet since I’m waiting to see how I paint my living room & dining room so the makeover will go with the rest of it. You found a chair for $5 at a thrift store?! I NEVER find good deals like that – prices are so much higher here! Ugh! Have fun making it over! Can’t wait to see! I have almost an identical chair (tufted back but sides on mine are also upholstered) rescued roadside just days ago. I have 5 yds pale aqua houndstooth wool fabric bought at a thrift shop for $3 and pale gray chalk paint. **serendipity** Sweet!! Ahhh!!! Lisa, its going to look amazing! Thanks, Selene! 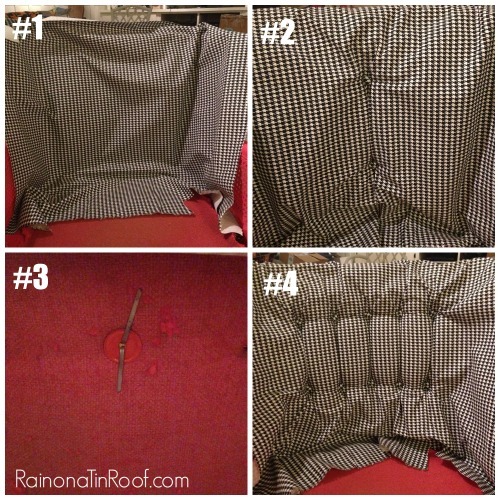 Really, upholstering isn’t a big deal, it just takes time – and usually more of it than you think! Wow, I love it, you did a great job. I love the colors and you can’t go wrong with houndstooth. You have such a flare for decorating I would never think to put the two together. That is why you blog and I don’t. Thanks, Patty! Honestly, halfway through I was wondering if I had made a horrible choice on the colors! In the end though, its just paint and can always be changed! Luckily, this one worked out! Oh my goodness! I have a very similar story:) My son found two fabulous vintage cane upholstered chairs – they were Henredons. He actually pulled them out of the dumpster! I also bought my fabric from Online Fabric Store – great source:) I wish I could attach photos … I am also so proud of my chairs:) Yours are lovely and its fun to find a “kindred spirit” through Pinterest. You found two chairs??!! I’m jealous! Isn’t Online Fabric Store just great for fabric? They have an awesome selection and great prices! Email me photos of your chairs! My email address is on my “about” page! I’d love to see ’em! Hahahahaha, Paige! You have me smiling from ear to ear! You are too much. If I am ever in central Arkansas, I will be sure to let you know! Thank you for being such a sweet follower! Great Job!!!! I love the fabric that you chose to reupholster. Great job! I have a chair makeover that I’ve been putting off for the better part of a year now, I guess I should just go for it. Yours turned out awesome! Roadside finds are THE BEST and you did this one some serious justice!! Love it! Jenna, unlike Lindsay, I say Oh Yeah to the houndstooth! I think its a perfect fit with the pink. You did an awesome job and I would be happy to have that chair sitting in my home 🙂 Visiting from the From Dream To Reality Party. The chair looks awesome, you did a great job in giving it a new life. WHAT?! You lucky, lucky girl! Seriously this is so cool! You did an incredible job on this chair! I love it…great tutorial too! I would love to have you join us for Centerpiece Wednesday linky party where tons of bloggers share their creativity, recipes, DIY projects and more…come on over and see and share with us. Love the chair! What a fun combo of color and pattern. Great job! Gorgeous roadside find! Love the choices of color you used and fabric! I love it! thanks for linking up to Fluster Muster where I like to party! This is such a great makeover! And you are so funny 🙂 Thanks for breaking it down and making it look so simple! Totally pinning 🙂 Have a great day! I about fell out of my chair when I saw your pin!!! I rescued the same chair, albeit with ugly burgundy fabric, from a neighbors trash pile! I live that my teenage son was with me and was mortified! Lol the chair is in my daughters room with a throw on it- because Im scared to upholster. And..I had thought I would do the same thing with the seat. Thanks for the tutorial! I’m gonna get over my fear and go for it! You can do it, Andrea! It does take some time, but its not too hard! 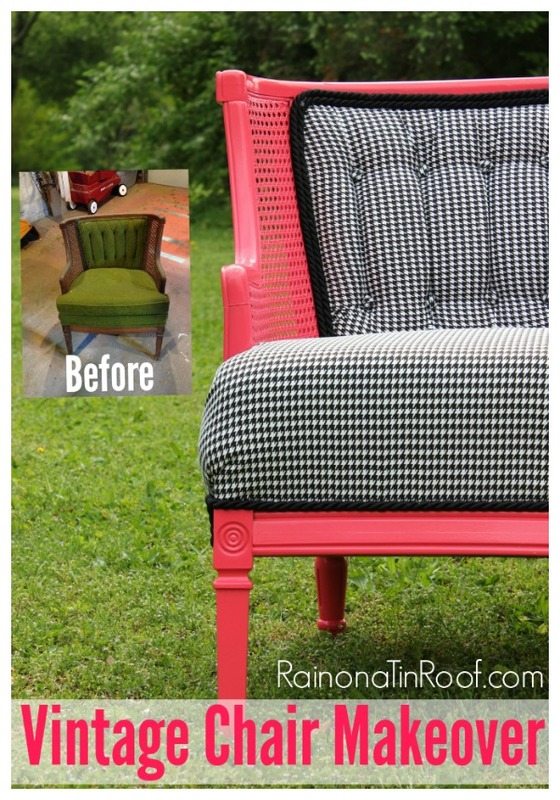 What a dashing little houndstooth makeover! Wow, Jenna, that is a beautiful transformation. I love the style of the chair and the colours and fabric you chose are perfect. I agree – it would be fabulous in a little girl’s room. Great job! Oh if it’s possible to have a crush on a chair, I have one on yours. I actually own a blue velvet old chair, that looks very similar, that totally needs a face lift like this. I love the bright color with the black and white. Great work! I LOVE this! I love the pink and the black, so classy! You did a great job. Now I need to start looking for something like that to do! Kudos to you for doing some grad school! I’ve been there – its rough! Thanks so much – I just put up the new header yesterday, still can’t get it centered just yet. I really can’t believe the chair turned out as well as it did! Thanks! I have almost the same project to do. I am terrified! How did you get the black trim around the fabric? Did you staple that? Thanks for any help! Hey Gwen! Nope, didn’t staple it – I just hot glued it on there! You can also use fabric glue, I think. If you go the hot glue route, just glue a small line to the back of the trim or onto the chair / fabric wherever you want it and securely push it on! Thanks, Kim!! I’m sure that your chair makeover rocks! !